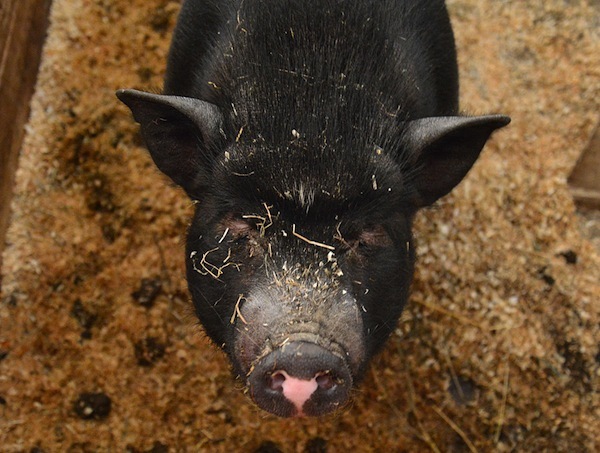 Piggy Smalls (Piggy for short) arrived at MFS during the summer of 2015. He is a Vietnamese potbellied pig and was originally purchased as a pet "teacup" pig. He was brought in by a woman and her son, who loved him very much. They were told by the breeder that he was expected to stay under 50 pounds, but within a year he had already grown to 100 pounds and the family realized that they could no longer care for him. When Piggy was dropped off, there was a very tearful good-bye. He has adjusted to farm life nicely and wags his tail when volunteers and visitors scratch his belly, and he likes to go on long walks, which often involve short bursts of running!